I am in Desperate need of some help in finding a home for my Mia. Mia is 4yrs old, unaltered cream and white. She does have an aggressive behavior and has bitten our daughter. I have called a million places trying to find a home for her because I cannot bring myself to taking her to Animal Control. This is truely breaking my heart! If anyone can either point me in the right direction or is able to take her please contact me. My husband and I are seperating and he is very pushy about me getting rid of her. I live in West Palm Beach, FL and I can possibly help with transporting her if necessary. I do have the papers that were given to me by the store I purchased her from. I am also including a photo. I can't help with adopting Mia, but I wanted to try and reassure you about your post. Please try to calm down (especially around Mia) because she can sense your anxiety and that won't help anyone. Lots of people are working right now, so they may not be able to post during the day. You'll probably get some assistance later in the day. Have you had Mia checked to see if there's something medically wrong with her? It could be that she's not feeling well and is cranky because of it. I would never condone a Chow (or any animal) biting a child, but a lot of times there's a reason behind it. Maybe you could tell a little more about how Mia bit your daughter. How old is your daughter? Was she left alone with Mia? I'm not trying to pick on you, just that there might be more to the story that even you don't realize. Chows are not normally aggressive...especially towards children. With a pending separation, your household is likely not as peaceful as it once might've been. With a divorce going on there's probably other things going on in the home that might be upsetting your Chow, A chow may not know what a divorce is but they sure know when something isn't right in the home and she can since her world is falling apart, keep things calm around her she may not be so edgy. So as I type the house is shaking like hell guess were having an Earthquake, Ahh Ca living. I'm sorry to hear that you are going through such a bad time. Can I suggest that you spay Mia before handing her over to anybody.... Just to ensure that she doesn't end up in puppymill situation for the rest of her life. Take care. Layla wrote: I'm sorry to hear that you are going through such a bad time. Can I suggest that you spay Mia before handing her over to anybody.... Just to ensure that she doesn't end up in puppymill situation for the rest of her life. Take care. Great suggestion, I will second that one. Its probably the best thing she could do for Mia's life before handing her over to a stranger. I purchased Mia almost 4yrs ago when she was about 6mos old. She was a great dog for awhile then started showing some aggressive behavior to strangers. She has bitten my daughter twice to be exact. My daughter is 15 and has never really warmed up to Mia, I think she might have tried some but not as much as say myself. The first time my daughter was bit she was walking down our hall and Mia jumped up on her and grabbed her arm that my daughter put in front of her to protect herself. The second time she was bitten my daughter let Mia in the house from the patio, once Mia was in she noticed that she had left some food on the coffee table and reopened the patio doors and told Mia to go outside so she wouldn't get to the food. Mia had not seen it, at first I thought is was a food thing, but my daughter said Mia started for the door like normal then all of a sudden turned direction and lunged at my daughter once again biting her on her arm. After the first time everyone told me I should have just taken her to animal control right then and especially after the second, but I am too much of an animal lover and cannot condone killing her just because she might be doing something that we don't understand. That is why I am at the point that i am at. The divorce situation is just recent, within the past two months, her aggressive behavior was WAY before then. Thanks for the posts and advise. Question on Mia -- when she is biting, is she drawing blood -- like are these "real"dog bites? Any type of bite is scary but I am just curious. Sorry to hear that you are going through this, hopefully someone on this site can help you. If anyone is thinking about adopting her I don't think there is anything to worry about with this Chow, Not liking strangers is typical Chow and two bites most likely snaps with contact on the same person in 4 years doesn't make a Chow vicious. If it were an actual bite there would be more to the story then she bit my daughter on the arm. There has to be a reason the Chow and daughter never got long, Like all Chow bite stories I'm sure there's more to the story. Have you been able to get in contact with any of the rescues on the lists? Times are tough right now so you might have a difficult time finding a new home. Have you thought about a behaviorist to try and help Mia get along better with your daughter. Maybe your daughter could be the only foodgiver/caretaker for Mia and that way they'll learn to bond with one another. If she's 15, she can be responsible enough to handle some training (IMO). Hello, How is your Chow with other dogs? Also, I know Chows and cats do not normally mix but is there any chance that Mia likes cats? I've read a lot of great responses and I am very greatful for all of your advise. The bites on my daughter are actual dog bites, she will be scared for life, something I have to live with. Second, bottom line is we have to get rid of her, my husband hates her and it's only causing more and more conflict between our family so training, working with her, getting to know my daughter better is not an option. Mia gets along great with cats, we have a cat and when Mia was allowed in the house the two would play, well Mia would play I think the cat was annoyed, but even if she actually caught the cat or pinned him down she never bit him or hurt him. Thank you again with all of you responses. I hope this helps alittle more. A Daughter that never like her, a Husband that can't stand her. I would call it anxiety and fear more then aggression.... 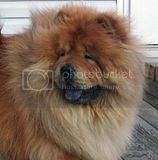 I hope someone on this site will give this Chow a second look I think he's getting a raw deal being labeled aggressive. He just needs a Chow friendly home that has more experience with Chows. Anyway of getting her to West Texas if they have room. Just so you know, If you walk into a shelter with a Chow it will be dead within a week If you mention agressive with a Chow it will be dead before you get back to your car. judeagz1455, are you interested in adopting Mia? We can possibly help with transport if you're a good match. jenbarone, have you contacted any rescues for help? I would seriously chock the bites up to anxiety and not aggression. Most Chows are very sensitive to stress and react to it in different ways. I have one that's coat shows if she's stressed. jenbarone, would you be willing to ship Mia by air to a potiential adopter? WTCR can't take Mia since she has a bite history. That's probably going to be the case with all rescues. fillyok wrote: WTCR can't take Mia since she has a bite history. That's probably going to be the case with all rescues. To bad the Chows side of the story can't be told, again I say two bites in 4 years to the same person isn't a bite history, Hell I would hate to see the label they put on Pekoe I have a few scars from non-intentional bites or scraps. Its funny how Pekoe has one of the worst temperaments on this site, Hates to be touched, hates strangers, hates vets/groomers, not to found of kids yet can be trusted to walk in a crowd of 50 people but has never bitten anyone in 11 years except me and it was my fault. Mia's getting a bum rap as far as i'm concerned. Incase anyone is wondering what's it our business or why we are so concerned about Mia is because there are 3 of us trying to get Mia rehomed. I won't mention names to protect the innocent. Plus the publicity is good because it gets her noticed. Jeff are you still in contact with her owner? Just curious. Laura wrote: Jeff are you still in contact with her owner? Just curious. Nope, all we can go by is her posting, were just trying to avoid this Chow going to a shelter she ask for someone to take her so were trying to find someone to take her that we know won't be eating her..Probably just wasting our time but if that Chow goes to a shelter labled agressive she's a goner. Does this mean she is no longer allowed in the house at all?? If so, what are you doing to keep up her socialization with the family and/or other people? Mia is still with us but her time is limited. If there is ANYONE in Florida who will take her PLEASE!!! I am willing to drive and we can either meet half way or I can go where ever. I just don't want to take her to a pound...this is killing me!!! I have called tons and tons of shelter and they are all full and now with TS Fay around it's making it even worse. Mia is staying on our enclosed patio with A/C. As far as aggression or she's just scared it's hard for me to tell the difference. All I know is whenever my daughter goes around her she growls and snarls, if we were to give her any more time I'm sure she would go after her...has my daughter taunted her in the past? yes, was that good? of course not. But when she wasn't doing anything but walking down the hall and the dog just jumps up and grabs her arm...don't know if you qualify that as scared. Please again if anyone in Florida is willing to take her I will make arrangements to get her there. Please...has anyone heard anything about this chow finding a new home? Are there any rescues near by where the owner could take her? I pray this chow doesn't get put down because of ending up in a shelter. Sounds like the lady is the only one in the family that likes the chow and vice versa. Its heartbreaking...dogs know when they arent liked. gochows is looking to find someone a chow in Virginia, but Mia's mommy is willing to travel a bit to get Mia to a forever home. Are there any others that live in the east coast area that are willing to assist in getting Mia to a loving forever home? I just hope this baby can get somewhere and soon...she needs a loving home!! I might be able to get some volunteers lined up for transportation from the southern states if needed.